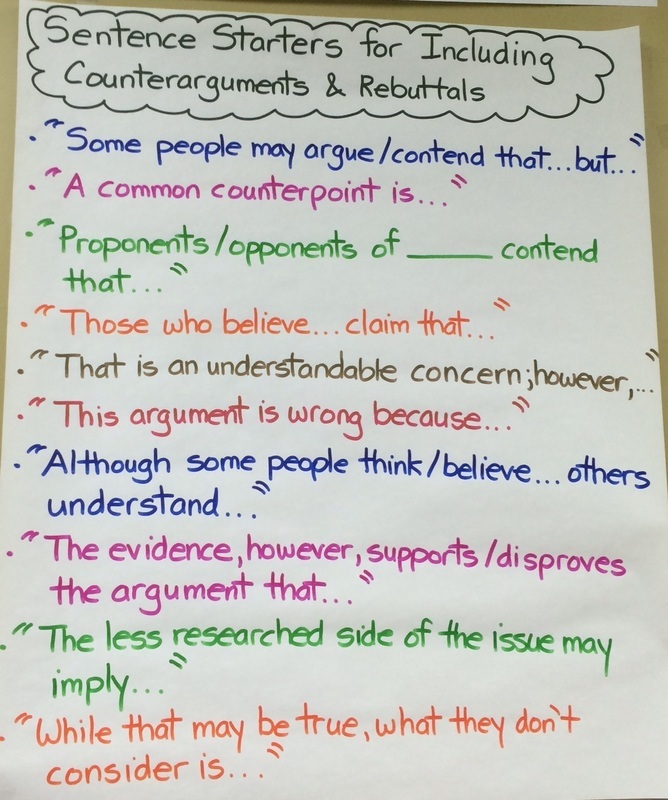 Strong debaters (and writers) test and defend their positions by stating their claim, giving reasons to back up that claim, and giving evidence to support each reason. 1. Start with a clear, strong claim. “I take the position that _________ because [Reason 1], [Reason 2], and [Reason 3]. 2. Give reasons to support your claim, backed up with multiple pieces of evidence. 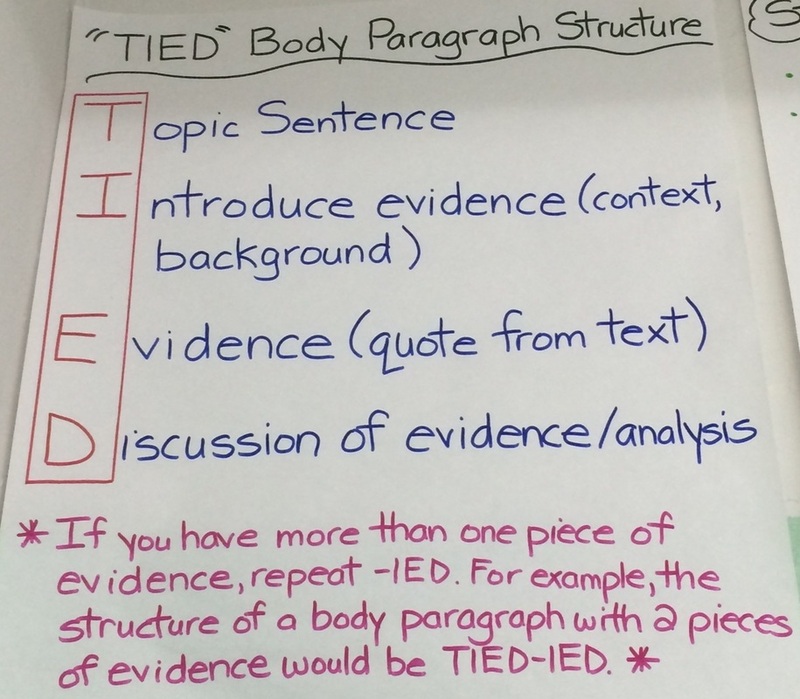 ​Don't forget TIED paragraph format when writing your body paragraphs! ​Strong writers craft compelling arguments by sorting and ranking their evidence, and deciding which evidence supports their point the best. ​When defending an argument with text evidence, one of your most important moves is to sift through your evidence. Don’t just present evidence in the order you discovered it. Instead, sort and rank it, deciding which evidence matches each point and which is most compelling. You want to present the evidence that packs the biggest punch! How well does each piece of evidence match my specific point? How hard is this evidence to argue against? How surprising and compelling is this evidence? Will it get my reader nodding in agreement with my point? What work will this evidence do? How will I use it to strengthen my argument? Look at the example below. Given the claim and topic sentence/reason, which do you think is the STRONGEST piece of evidence the writer can use to support her thinking? 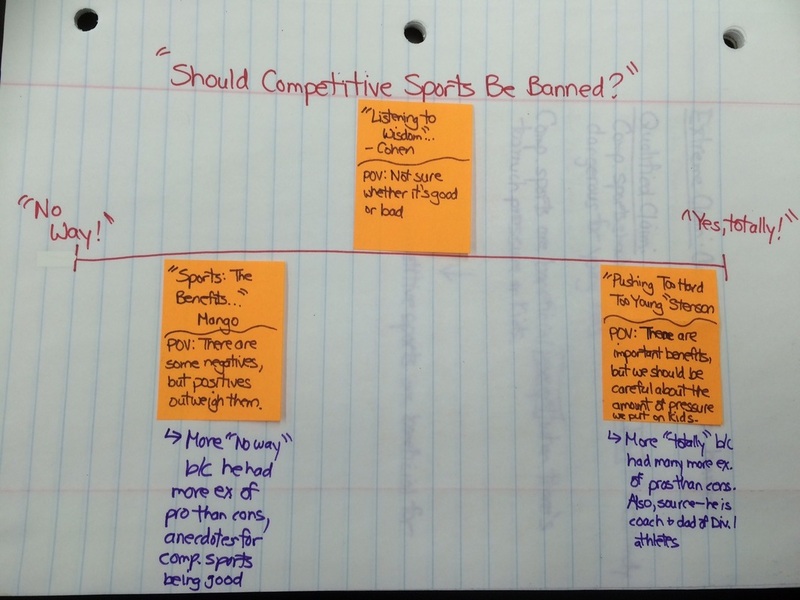 The first piece of evidence ("While competitive, organized sports are often seen...") would NOT be the best piece of evidence to use because it merely RESTATES the reason. It is not actually an EXAMPLE of how sports put too much pressure on kids. It is debatable whether the second or the third piece of evidence is the strongest. The second piece of evidence ("Immediately before the first period began, the coach...") would be a good EXAMPLE of a specific person who witnesses the pressure put on kids who play sports. So, it matches the topic sentence/point well. It is also compelling because it is a personal story (anecdote) that is moving. The third piece of evidence ("One of the most comprehensive surveys to date...") may not SEEM like it supports the topic sentence, because it talks about injuries and not pressure, but it COULD actually be a good piece of evidence depending on how you spin it! IF, in your discussion, you explain that all of these injuries are caused because athletes feel pressured to play even when they are injured, it would work well! 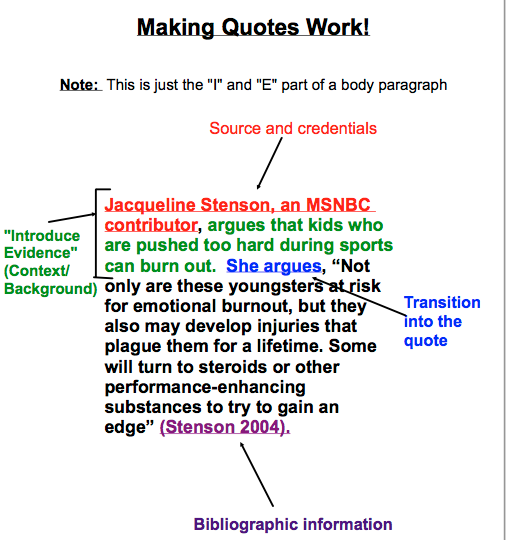 Remember to transition into your quote by citing the source! 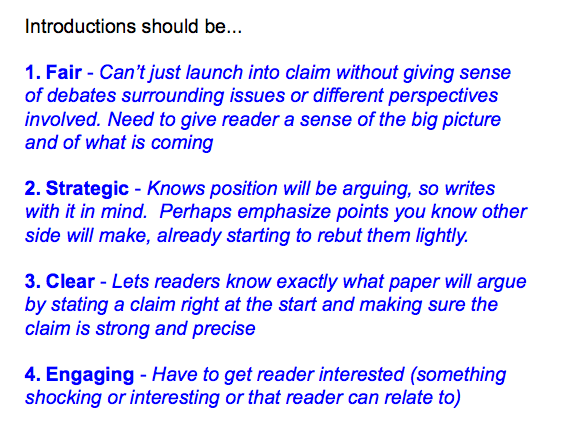 Below are a few sentence starters you can use to vary the way that you cite your sources. Give some context or background if it is needed. Name the source and give credentials that set him/her up as an expert if you can. Cite the bibliographic information so others can find the information. ​Transition into a discussion/analysis of the quote. ​Click on the icon below to download the "Citing Sources" worksheet. 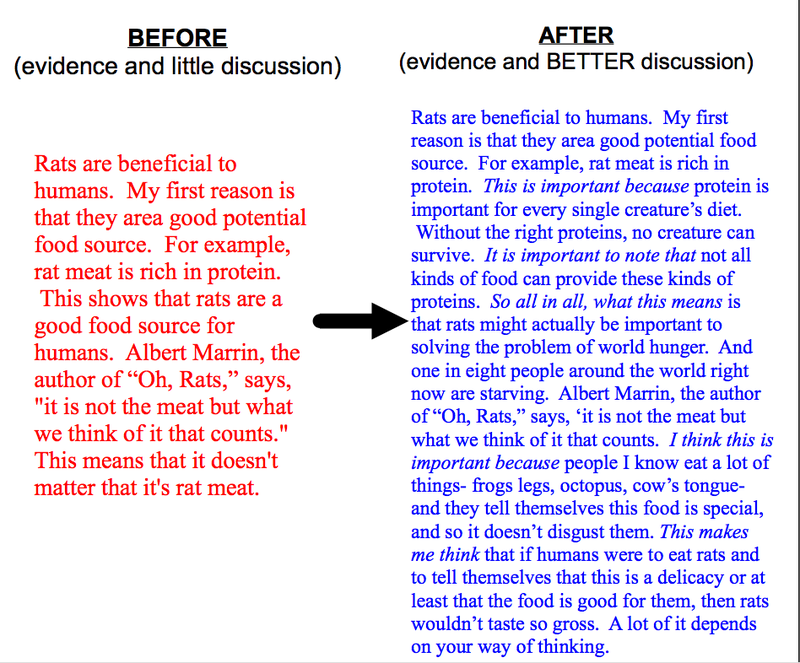 ​Strong writers improve their arguments by analyzing the evidence in ways that help the reader follow your argument. Your own ideas/analysis of the thinking of others are just as important to include as citations. Pasting together a bunch of other people’s ideas is not an argument. An argument includes researched information layered between the writer’s own thinking and explanations. 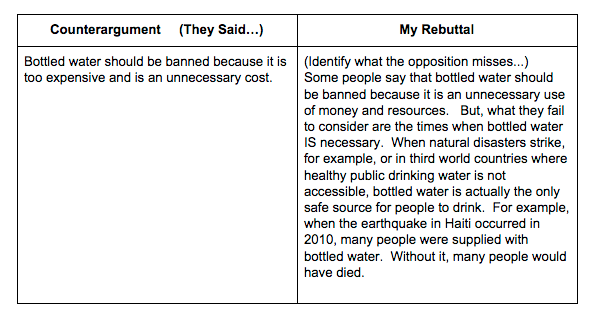 Look at the example below and compare the two paragraphs after discussion and analysis of the evidence/quotes is added. The argument becomes so much stronger and more convincing! 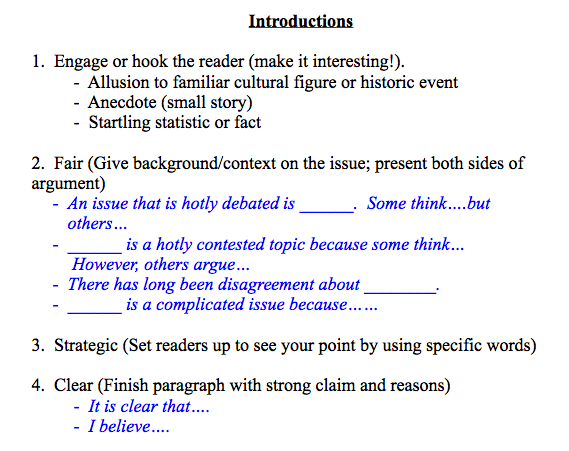 When you are adding discussion and analysis to YOUR draft, remember you can use the sentence starters that you learned during the literary essay unit! ​Also try out these strategies! 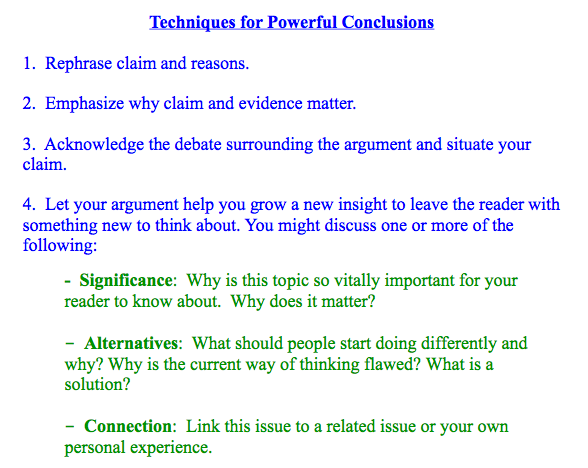 ​Strong writers strengthen their arguments by tracking points they can use to plan a rebuttal. Make a CLEAR, STRONG claim. Give reasons to support your claim, backed up by multiple pieces of evidence. "The less researched side of the issue may imply..."
"While that may be true, what they don't consider is..."
Strong writers craft compelling introductions by presenting information strategically. ​Strong writers craft powerful conclusions by providing readers with new insights. 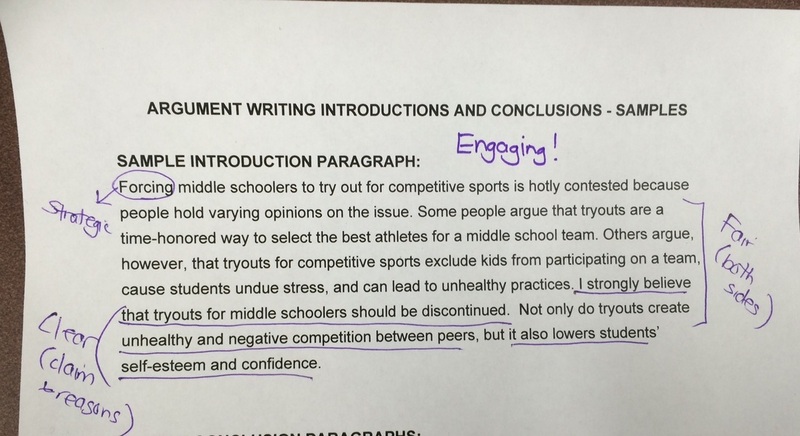 The issue of middle school tryouts is a complex one. There is no doubt that tryouts are in some ways a historical tradition. But simply because something has been the tradition doesn’t make it right. The best traditions are not those that have been around the longest, but those that make everyone feel a part of them. And by definition, tryouts exclude some members of the school. It should be a priority for our school to allow anyone and everyone to join our teams. A good first step is to help develop our intramural programs. Strong writers distinguish their perspective from others by creating more nuanced claims. Most arguments put down a stake somewhere in a progression. On the two ends are the extremes - “Yes, totally!” on one side and “No way!” on the other. But, most arguments aren’t just one way or another. Strong writers strengthen their arguments by presenting their arguments in a logical, compelling fashion. When argument writers construct their argument, they think about the order in which they present their reasons. They put it in the most logical and compelling order so that their readers are convinced that their claim is correct. In general, you want to put your STRONGEST reason last, and your weakest reason somewhere in the middle. As you are drafting, make sure you also present your reasons in the same order as you did in the claim!